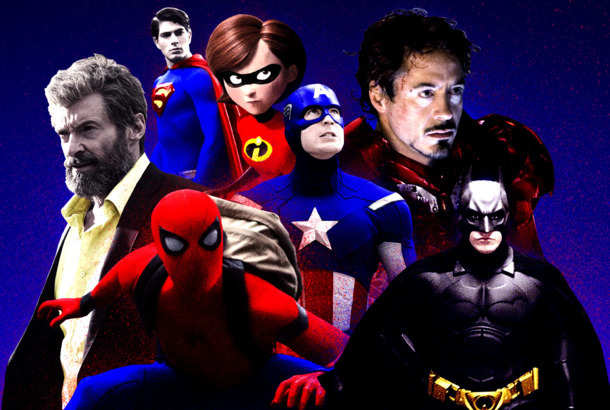 The 30 Best Superhero Movies Since BladeAnd why Into the Spider-Verse cracks the top five. Chris Evans Signs Off As Captain America — or That’s What He Wants Us to ThinkIs the shield really hung up for good? Kevin Feige Sees the Bright Side of James Cameron’s ‘Avenger Fatigue’ Comments“There are other stories to tell besides, you know, hypogonadal males without families doing death-defying things,” Cameron said of the franchise. The 30 Best Superhero Movies Since BladeWesley Snipes’s vampire swordsman started a revolution. What Happened in Today’s Secret Trailer for Avengers: Infinity War?The gang’s getting back together. Avengers: Infinity War Isn’t Two Movies Anymore2 Infinity 2 Handle. Are the Avengers Inherently Good or Evil?Ethics questions for the ages. It’s Stan Lee’s UniverseHe built Marvel Comics and laid the foundation for today’s blockbuster superhero movies, and has changed pop culture as we know it. Here’s how. Do Characters Belong to Their Fans or Their Creators?A married Han Solo, a racist Atticus Finch, and our impending canon crisis. Why Hollywood Is Caught in the Blockbuster TrapA study by Harvard Business School professor Anita Elberse shows that risky big-budget films are studios’ safest bets. Watch an Astounding FX Reel From The AvengersSo, how’d they do it? Learn How They Shot That Unbelievable Sequence in The AvengersSo, how’d they do it? Learn Everything That Was Wrong With The Avengers (in Three Minutes)Don’t let this ruin it for you. Avengers-Themed Tea PartyJayla made some good choices in her third year. Watch Grover and Cookie Monster Parody TVOut of the way, kids, it’s grown-up time! Watch an Honest Trailer for The AvengersIt’s funny because it’s true! Watch a Deleted Scene From The AvengersTake it away, Cobie! Avengers 2 Dated for May 1, 2015Get ready. Joss Whedon Will Return for the Avengers SequelHe’s signed to write and direct. The Avengers Is Crossing $600 MillionThat’s huge. Watch The Avengers Intro, Firefly-Style We still miss Nathan Fillion. Are You Ready for the New Age of $400 Million Box-Office Blockbusters?Until now, we’ve never had three movies gross more than that figure in one year. Last Night on Late Night: Bill Murray Appeared As a HologramPlus: Chris Hemsworth played a mini-harmonica and did a little jig, and more, on our daily late-night roundup. The Avengers Is Now the Third Highest-Grossing Film EverBehind Titanic and Avatar. Your Box Office Explained: The Avengers Cruises by BattleshipThe Avengers bests three newcomers to make $55 million in its third weekend. Battleship Sinks With $25 Million Opening WeekendWho did the sinking? : The Avengers. Avengers Clears $400 Mil in U.S. in Two WeeksSo much money so fast. Robert Downey Jr. to Bank $50 Million Off The AvengersOh hi, real-life Tony Stark mansion and actual Iron Man suit.